Are you looking for something stylish this summer, a gift for that special little girl in your life, then why not surprise them with the Toggi Girls Goldie Long Sleeved Top and be the best Mum, Nan, Auntie, Friend! 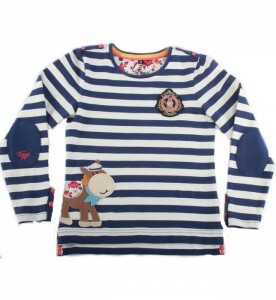 The Toggi Goldie long sleeve top is a classic piece which creates the perfect nautical look for youngsters. With its Bretton Blue stripes they make the Toggi Goldie Long Sleeve Top just perfect for summer days, but is equally as versatile for the colder days and can be layered up with Toggi Girls Beauty Fleece Sweatshirt and or The Toggi Girls All Star Gilet to create a fun yet versatile look. The Toggi Goldie Long Sleeve Top has Beautifully executed appliqués and embroideries along with the floral print trims making this a real winner. Cotton Jersey with Stretch meaning its machine washable, making it an added bonus for parents.